The Park View Is A collection of 32 masterfully designed residences with boutique condo like finishes. Each unit features` high end designer appliances such as Bosch washer/dryers, Liebherr kitchen appliances and Duravit fixtures. Floor to ceiling windows and several private and public outdoor spaces allow for great natural light from multiple exposures. 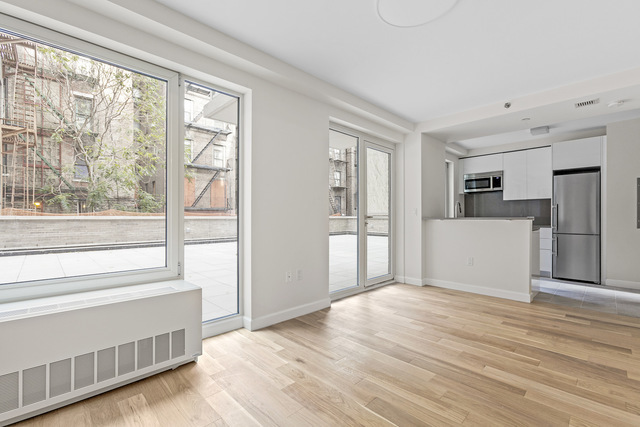 The units showcases white oak-wood floors , recessed lighting, heated bathroom floors and storage.The building highlights include a part time doorman , video intercom, storage room, gym and a furnished patio perfect for outdoor entertaining with friends and family. Located in East Harlem is a daily mix of cultural, historical, and artistic fusion with continued growth from the food, culture, and entertainment. Located a few steps from Park avenue its a stones throw away from La Marqueta, a market place for retail and food vendors the Urban Garden Center where Grow NYC holds its farmers market. In the morning grab a cup of joe from UGC Eats which is a farm to table restaurant. Enjoy a plethora of restaurants, wine bars and cafes along Lenox Avenue which is a short jaunt and shopping on 125th that includes the newly opened Whole Foods. East Harlem is an ever evolving neighborhood that holds onto its roots so, why not Live Harlem! price reflected is net effective of one month free of a 12 month lease.